ST.PETERSBURG , October 13. /TASS/. 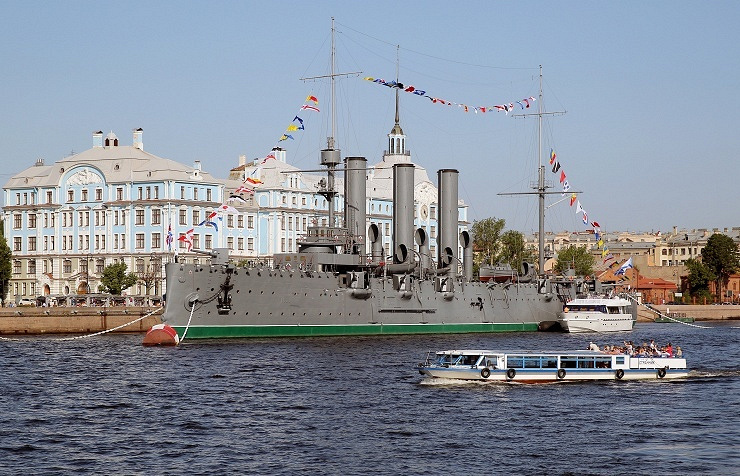 The Aurora cruiser — a legendary battleship that fired a historic shot in 1917 to start a socialist revolution in Russia, will be brought back to its harbor in St.Petersburg in 2016, Chief of the Culture Department of the Russian Defense Ministry Anton Gubankov said on Monday. The Aurora was taken to the shipyard for repairs in September. Last year the legendary ship marked its 110th anniversary. It had last been overhauled in the 1980s. As a battleship the Aurora took part in three wars, including the 1904-1905 war between Russia and Japan. It's overall service record at sea is 100,000 miles. The 1917 revolution in Russia was the most significant event in the record of the legendary battleship, which gave a signal to start the October 1917 uprising followed by a storm of the Winter Palace in St. Petersburg. After the revolution, the Aurora was used as a training ship. It was damaged during World War II. In 1948, the repaired ship was harbored at the Petrogradskaya embankment in St.Petersburg. Until 1956, the Aurora had been used as a training ship for cadets of the Nakhimov naval school; afterwards, the ship became a museum.